This is going to be a long story, Rita, so brew a fresh pot of coffee and dig in for Part 1. This was not a concept that I had ever considered while living in Europe because I did not have to. I was immersed in the highest level of dressage for many years and all of us who competed at that level “dropped everything and went”…for the WEEKEND. That’s how you live when you are a professional dressage rider in Germany. In the United States, you have to drop everything and leave for MONTHS. You leave the country, leave your family, and leave your business, your growing debt, your other horses… everything. It’s not like you can go home for Monday through Thursday and then hit the road again. So, as a professional rider living in the United States, it’s not always an easy decision to pursue your sporting goals at the cost of all else. And let’s mention the cost. My four months training and competing in Europe cost me $80,000.00, Rita, and that is not counting the expenses incurred maintaining a stable at home and the business I lost during those months. I am eternally grateful for the $20,000 training grant given to me by the U.S. Equestrian Federation and for those loyal clients who kept their horses in training with my staff while I was away. Without that help, I never would have considered the trip at all. Finances also were on my mind last fall when I started the Gladstone Dressage Initiative to raise prize money for the 2014 Selection Trials in June. I knew that the riders who would make our short list and go to Europe for at least eight weeks would need more financial support than the USEF could provide for them. I wanted the funds I raised to be earned by our top competitors in contention for the team as prize money, whether I would be one them or not. One of the most liberating feelings you might have while getting on a plane for Europe is knowing that at least your credit card payments will be covered while you are away. My other reason for raising the $150,000 in prize money was to encourage our Federation to hold the selection trials in Gladstone. There had been talk of holding the trials in California, perhaps encouraging a sponsor to put up prize money there, etc… I knew that the best thing for our horses would be to go east and keep going east after the trials. Perhaps some of you remember 2008 when we flew east coast horses to California, then back to Europe, then on to China…? Well, let’s not get involved in those arguments again. Fortunately, our U.S. team veterinarian, Rick Mitchell, and owner of the Dutta Transport Corporation, Tim Dutta, spoke up this time about horse welfare, dehydration, recovery time and what it meant for our horses to only fly east in preparation for the WEG rather than criss-crossing the country first and adding those few but detrimental extra hours in the air to their travel stress. I think the impact of Mitchell’s and Dutta’s information had already convinced our Federation to hold the selection trials in Gladstone before I put the icing on the cake at that meeting by announcing the success of the Gladstone Dressage Initiative. Because I was able to convince a large group of knowledgeable horsemen and benefactors to follow Michael Davis’ (owner of Cesar Parra’s Van the Man) idea of “coopetition”—competitors helping other competitors to improve the state of the sport as a whole—the GDI was able to put $150,000 in prize on the table as an incentive to hold the selection trials on the East Coast. I would like to say thank you, again, to all of you who answered my phone calls, listened, understood and agreed to contribute to the Gladstone Dressage Initiative. You also contacted others who might be interested and the snowball effect was palpable. I was honored by your trust, your cooperation and your willingness to help our team in this way. It was a group effort. It helped our sport. And I was proud to be a part of it. Sadly, Rita, raising funds for the GDI was the full extent of my participation in our selection trials. I made the decision to leave for Europe at the beginning of April with Mane Stream Hotmail (aka Scottsdale), not knowing whether I would return for the selection trials or not. But I can tell you that at the time, there was nothing more I wanted to do than make that team for the World Games. Hotmail had become a Grand Prix horse over the short season in Florida, January through March. He had learned all the movements, he had learned how to go down the centerline, he had done his first freestyle and now I had to find out how fast he could improve and if he could take the pressure of trying to make a team in his first year of Grand Prix. I had to keep showing and I knew that Europe would be our best testing ground. 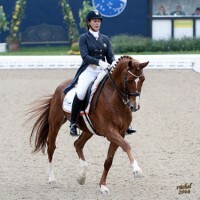 We were also in a reserve position for the Reem Acra FEI World Cup Final at Lyon, France. So if anything had happened to a U.S. participant there, we could have stepped into their place. Fortunately for U.S. dressage, everyone stayed sound and healthy and I moved on to plan B—first start at the Hagen CDI4* in Germany. 2) More symmetry in the contact with his mouth and in the bend. 5) Bring routine to the flying changes, better balance in the pirouettes and find a way to improve the transition from passage to piaffe. 6) Train Hotmail to handle the ribbons ceremonies, the loud music, the chaotic crowds in European venues so that tension does not effect his performance during the test. I had not felt any tension in Hotmail in Florida. But I realize now that showing at the same venue every weekend is not a realistic way to prepare for top shows in Europe! We arrived in Europe mid-April and began to train in earnest for our first show in Hagen at the end of the month. Hotmail had traveled well. He was fit, training better than ever and felt really ready to step up to the plate for me. And he did. Click here to see our first test in Germany at the end of April. Here you can see that my training tasks 1-5 have been addressed and that we are about to meet the goals I had set for us. We had an unfortunate mistake in the extended canter that led to the loss of too many points. AND, Hotmail was not generously scored anywhere in this test (scoring only two 8s) when he could have scored many more (or at least 7.5) so the points lost on the mistake cost us a lot. You can afford to make a mistake or two ONLY IF the judges are giving you the highest possible points for the things you do well. This was not the case on this day and the 68% was not quite enough to inspire me to put him back on a plane to the United States. If there is one thing that I brought away from my summer in Europe, it is that WE MUST change the way our sport is judged if we are to secure our future in the Olympic Games. I have heard that statement from many of the powers-that-be for many years, but now, I finally understand it fully. And I am going to work on that. Did you know that the International Olympic Committee has downgraded dressage to a “D” sport? “E” is the lowest you can go before losing your Olympic status. Change has to come NOW. Getting back to the Grand Prix at Hagen, the other interesting thing about this test is what happened in the walk. Dietrich Plewa is commentating the test on video and he is absolutely right in that my horse was distracted by the environment. I could not keep him focused on the diagonal during the walk, which came as a surprise to me. This is key, Rita, and it was my first clue (although I did not realize it at the time) to finding that crucial piece which reveals the picture in your jigsaw puzzle. I had nearly forgotten that Hotmail is a Michellino. Number 6, handling tension at those chaotic European shows, would soon come into play. During the 5* at Munich in May, I chose not to go to the selection trials in Gladstone with Hotmail because I knew he was not ready to make a bid for the team, thus ending our chance to contribute anything meaningful to the U.S. effort to medal at the WEG this year. Even though I made some fantastic progress with my horse this summer, we are not the important story to be told in American dressage right now. Laura Graves and her scopey, talented athlete, Verdades, are the deserving heroes of our sport. My hat is off to this pair and all of our riders for the team in Normandy. In stark contrast to 2012, our team did the absolute BEST they could at the World Games. They excelled in all their tests and we landed fourth as a team which was far better than any of us hoped or predicted. We got there because of some damn good riding and I am proud of that. Congratulations to Laura Graves, Steffen Peters, Adrienne Lyle, Tina Konyot, Shelly Francis, Lisa Wilcox and last but not at all least, Caroline Roffmann, Jan Ebeling and Kathleen Raine—who just missed making the short list but perhaps shouldn’t have! U.S. dressage is on the move again—bigger, better, stronger, smarter, with more depth and more determination than ever before. We will be back on the podium soon. It will pay to look at our success this year with truly open eyes, to examine the factors that got us there and remain diligent about the things we can still improve. More on that soon, Rita, more soon. I’m Catherine Haddad Staller, and I’m sayin it like it is from Califon, N.J.
Training Tip of the Day: Timing is everything—in training and in life.